· Custom-made to fit your area for a tailored look. · Cover LARGE areas. Spans - up to 24 feet! · FREE computer aided (CAD) design service. · Over 40 handsome outdoor fabric choices, including Sunbrella� commercial-grade fabrics. Special-order fabrics available. 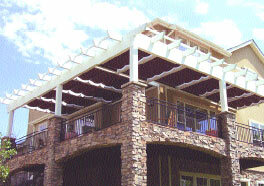 · Often do not shade entire patio, with projections of only 10 - 12 feet from the house. · Roof heights, door & window obstructions limit use because of awning pitch requirements. · Extremely vulnerable to wind and rain damage. ShadeTree� Canopies have a patented wind release system that allows the canopies to snap loose and move freely in the tracks so they will not catch and hold wind. Give us your most challenging projects and we�ll be happy to provide a CAD drawing - FREE!